We have worked our way (in Sunday school 4-6th grade and in our Christian School K-6th grade) through the Old Testament over the course of about 7 years. We choose one verse a week and memorize it by playing a whole host of games and always put the verse to a familiar tune. It's always a verse within the course of study for the week. We are now up to Judges. I wasn't able to find any visuals pertaining to the Judges of Israel; so I made my own, with each card having a synopsis of their lives. 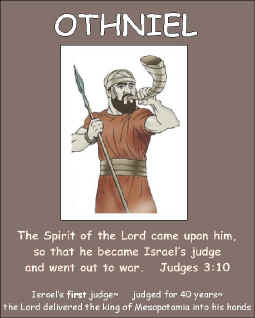 Continue reading about the Judges of Israel. It can be tough getting your child to attend Sunday School for the first time. I find this method to work for my little girl very well! I started talking about Sunday School and playing a few musical Sunday School YouTube videos, sang and danced with my girl to the Christian song and she enjoyed it. When I brought her to church for the first time she started telling me "oh this is similar to what we did at home!" So she was very happy to be there and took it better than I expected. Christianity, and specifically the claim from John 14:6, where Jesus says, "I am the way, the truth and the life," is often seen as being narrow-minded or exclusive. Yet, Jesus opened the way for all people to be included in God's Kingdom—Jew and Gentile. Jesus and the Apostles taught from the Older Testament—that was their Bible, they had no other. The teachings and writings of the Newer Testament are commentaries on the Older Testament. When we read the New Testament, we must learn to read with "Jewish eyes" and make a habit of asking, "Where will I find this in the Old Testament?" This "good news message," that is the "gospel message," is an Old Testament idea that God planned out from the very beginning, "He (Jesus) will crush your (Satan) head, and he (Satan) will strike your (Jesus) heel" Genesis 3:15. Jesus' declaration that he is the Way, the Truth, and the Life, is in agreement with the first commandment that says, have no other gods (Ex. 20:3). Why do you suppose God would make such an exclusive claim? Because he is the one true God who can help us and save us! In fact, all of the commandments should be seen as holy promises that reveal God's love. Let us look now at one evangelistic tool known as the Roman Road from the New Testament and compare those verses to what the Old Testament has to say concerning our sin and God's salvation-solution for humankind. Continue reading the Gospel message. SHARE this page with others! Like us and follow us on Facebook too!